Health clinics are scrambling to keep up with sudden demand, mostly among parents of children in Southwest Washington who had not been inoculated. 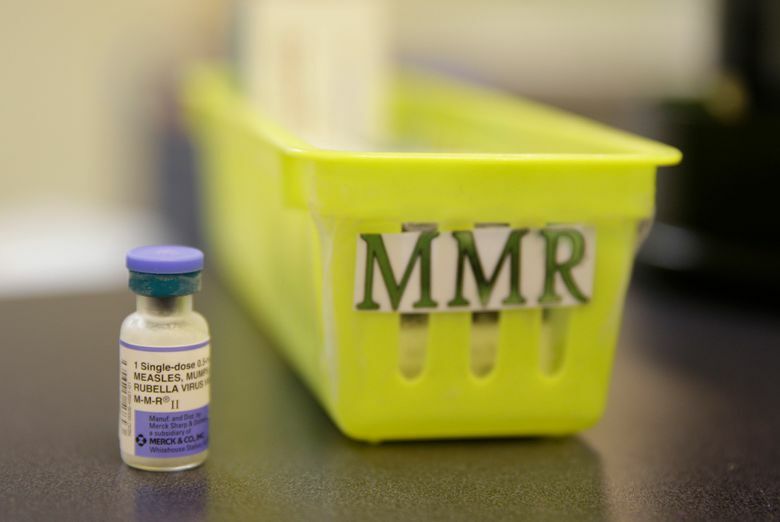 Demand for measles vaccine has surged in Clark County, where the highly contagious virus is linked to more than 50 confirmed illnesses this year — including among people who had previously shunned the shots. 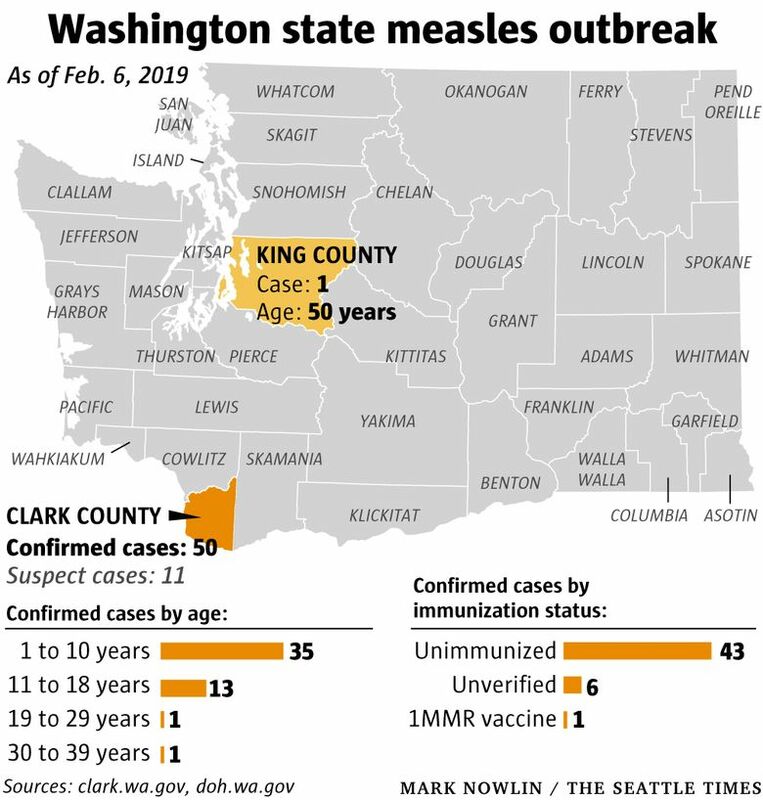 Orders for two types of measles vaccines in the Southwest Washington county were up nearly 500 percent in January compared with the same month last year, jumping from 530 doses to 3,150, according to state health-department figures. “During an outbreak is when you see an influx of patients who would otherwise be vaccine-hesitant,” said Virginia Ramos, infection-control nurse with Sea Mar Community Health Center, which runs six sites that offer vaccines in Clark County. The Vancouver Clinic, which operates medical offices and urgent-care centers in the area, reported that shots administered jumped from 263 in January 2018 to 1,444 last month, a nearly 450 percent increase. Statewide in Washington, orders for measles vaccine jumped about 30 percent, climbing from 12,140 doses to 15,780 doses, figures showed. In King County, the rise was a more modest 13 percent, from 3,960 doses to 4,480. On Wednesday, officials sent letters to families of 5,000 children in Multnomah County, telling them they’ll be excluded from school if they don’t have up-to-date immunizations or valid exemptions by Feb. 20. The Centers for Disease Control and Prevention (CDC) recommends two doses of measles vaccine, one given at between 12 months and 15 months of age and one between ages 4 and 6. Health officials say the shots are safe and effective, providing about 93 percent protection with one dose and 97 percent with two doses. Washington and Oregon are among 17 states that allow nonmedical exemptions from vaccination requirements for school entry, according to the National Conference of State Legislatures. Kaiser Health News (KHN) is a national health policy news service. It is an editorially independent program of the Henry J. Kaiser Family Foundation. Its coverage of end-of-life and serious-illness issues is supported by The Gordon and Betty Moore Foundation.